A DRUG group fell in the hands of police operatives during a drug bust at Hacienda Bariw in Barangay Sta. Teresa, Manapla, Negros Occidental, Monday morning, March 19. 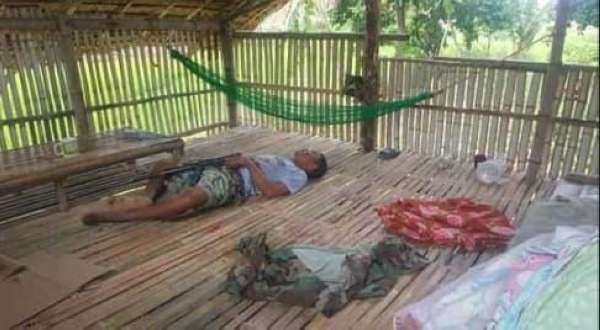 Four people were killed including alleged drug lord Alson Aguirre, 31, of Silay City. Also killed were Aguirre’s brother and their two companions, whose identities are still unknown. The drug bust conducted by operatives of the Manapla Municipal Police Station also led to the arrest of Aguirre’s live-in partner, Rodjilyn, and the group’s lookout June Espanola, an administrator of Hacienda Bariw and resident of Cadiz City. Senior Supt. Romeo Baleros, director of the Negros Occidental Police Provincial Office, said Aguirre sold a sachet of shabu (methamphetamine hydrochloride) to an undercover cop at about 7:30 a.m. at his hideout in Hacienda Bariw. After the transaction, Aguirre, however, sensed he was dealing with a policeman, which prompted him to shoot the operative and tried to escape along with his three companions. Baleros said the police operatives fired back and were able to kill the four suspects. He said one of the police operatives was hit during the firefight but the bullet did not penetrate the bullet-proof vest he had on. Police recovered from Aguirre’s possession 171 grams of shabu with an estimated market value of P1.3 million, an M16 rifle, a KG9, two .45 caliber revolvers, sub-machine gun, a .357 revolver, two handheld radios, three cellular phones and one grenade. Police also recovered a .45 caliber revolver from Espanola’s possession. Baleros said Aguirre was identified as a big supplier of illegal drugs in Negros Occidental and a member of the Divinagracia Syndicate Group in Negros Occidental. “They are an armed and dangerous group operating not only in Manapla, but also in the areas of Silay and Bacolod cities or the whole area of Negros Occidental,” said Baleros. In 2018, the Silay City Police Station also raided the house of Aguirre in Barangay Rizal, Silay City, however, only three persons were arrested while Aguirre managed to escape. Baleros said Aguirre’s live-in partner also admitted that his partner had a drug supplier in Manila known as “Madam,” who also supplied firearms. “His death (Aguirre) will significantly reduce the supply of illegal drugs in Negros Occidental,” Baleros said. Baleros commended the accomplishment of the Manapla police operatives. He will give them an award at Nocppo. Baleros said they are still conducting thorough investigation to determine the identities of Aguirre’s companions while Espanola and Aguirre’s partner were detained at the custodial facility of Manapla Municipal Police Station. They will be charged with drug cases.